I finally got to reading The Fates Divide even though it has been on my shelves since its release in April. I didn’t like the first book all that much, but I thought this one was even worse. 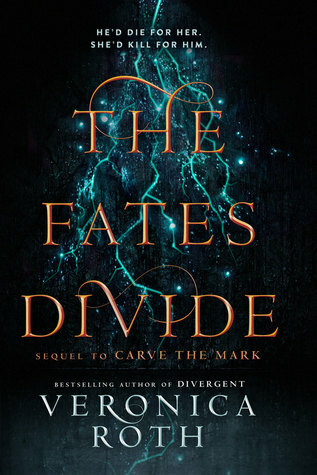 I give The Fates Divide by Veronica Roth two out of five hearts because it wasn’t even disappointing, it was just bad. I felt this book had nothing of context and I didn’t recognise anything from Carve the Mark back in it. The characters were a bit similar to the ones we left behind in Carve the Mark, but I didn’t care for them. The villain of the first book is killed off in the earliest part of the book and immediately I worried about the rest of the book. Then why did Veronica leave the villain alive at the end of the first book? Why not kill him off there and have a good rounded off the story and then write a new story in The Fates Divide. The entire rest of the story felt like a story separate from its characters. As if anything just happened to the characters instead of them doing them. It felt pointless and for all I care Veronica Roth had stuck the first few chapters at the end of Carve the Mark and was done with it. This book is not worth the read and it makes me wonder whether I even should pick anything up if it’s written by Veronica Roth. But of course I will if she ever publishes anything more, but I will be much more sceptical. This entry was posted in Book Review and tagged Adventure, Book Review, Romance, Science-Fiction, Veronica Roth. Bookmark the permalink.